Spacious. Avatara. Sounds pretty esoteric to me for a jazz organist, I remember thinking when I found a library cd of Freddie Roach’s The Soul Book light years ago. Fast forward to the present and here I sit with the original LP in hand. Quaint front cover. Roach sports a Zen-masterly grin and looks us in the eyes slightly mischievous. A modern-day Socrates? In any case, a man with a philosophical bend. Reading Roach’s narrative on ‘soul’ on the back cover, it shouldn’t surprise anyone that Freddie Roach, alledgedly, also was a playwright and actor. Roach’s musical style certainly suggests a lot of thought behind his notes and tones of modern organ jazz. Roach stepped into the limelight when tenor saxophonist and Blue Note A&R man Ike Quebec hired him for Quebec’s albums Heavy Soul and It Might As Well Be Spring in 1961. Solo albums followed on Blue Note, of which 1963’s Mo’ Greens Please featuring Kenny Burrell was particularly succesful. Roach showcased a laid-back, tasteful style and touch. In the mid/late sixties, Roach progressively brought to the fore his inherently groovy style. 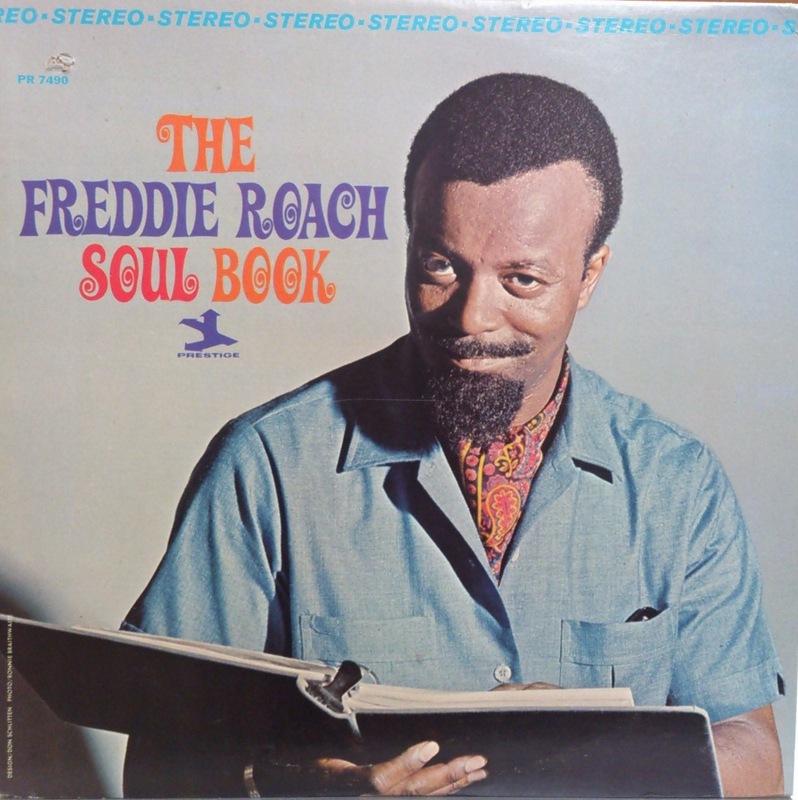 The Soul Book, the first album of Roach on Prestige after his Blue Note period, includes a good example of Roach’s funky intentions: One Track Mind, a typical mid-sixties affair, a gritty boogaloo. Roach cooks and tenor saxophonist Buddy Terry mixes a charming swing feel with some tough Johnny Griffin-style tenor. The ballad Tenderly gets an heated midtempo treatment. Black sheep in Roach’s soulful herd is pop tune You’ve Got Your Troubles. It’s taken from another session with a different line up including conga player King Erisson. It’s a generic calypso version. The Bees, the closer of the album, is better. The quirky blues theme is bound to put a smile on your face and the uptempo shuffle inspires guitarist Vinnie Corrao (who played with organist Don Patterson before hooking up with Freddie Roach) to deliver hot and articulate phrases and Freddie Roach to build a splendid tale that goes from quiet swing to fire alarm. Spacious and Avatara, however, are the album’s highlights. Avatara is a bittersweet, moody piece which, Roach explains, ‘is the wedding of cosmic and conventional, (…) the background music from a dream I once had.’ Buddy Terry shows great command of the tenor, conjuring velvet pleasantries and haunting, whispering, yearning sighs and squaks. I would like to hum the tune to my kid daughter at least twice a day while smothering her with hugs and kisses. I should. If only she wouldn’t prefer girl groups to jazz and hate the touch of my prickly beard. Hey baby, I’ve been sporting this stubble face ever since I got out of high school, be glad I don’t wear one of those hip Santa Claus affairs. The mid-tempo Spacious is my favorite track. It’s one of those compositions that combine relaxed swing with an elaborate outlay, like Eddie Harris’ version of Ernest Gold’s Theme From Exodus, also a tune that remains glued to your mind forever. It’s a free-flowing tune with an infectious, ephemeral theme. Exuding a vibe that makes you warm although you’re out standing in the cold. Roach develops a solo that excludes well-worn gimmicks but instead piles articulate phrase upon phrase like a toddler stacks Lego cubes. A search for new vistas.